� Use with Deck boards measuring 1 -1/16" to 1 -1/2". 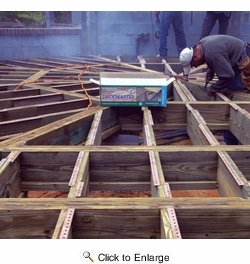 Hollow-core composite decking measuring 1 -1/16" or more. 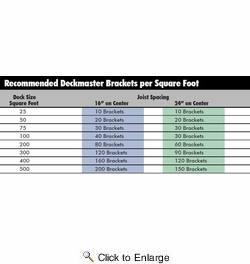 DECKMASTER Hidden Deck Fastening System - The strongest longest lasting decks are built using Deckmaster brackets. Its unique under mount design uses fasteners at two angles, virtually eliminating deck racking and shearing. And because Deckmaster is completely hidden beneath the deck boards, there are no exposed screws or nails on the deck surface. As such, moisture won't pool around screws and nails reducing the potential for water damage associated with decks top fastened with screws or nails. 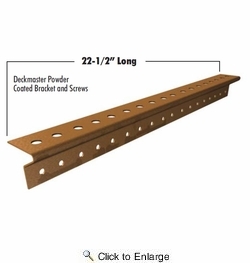 Deckmaster is the best hidden fastening system available. Grabber's Deckmaster Fastening System is designed to hide all fasteners beneath the deckboards making the deck stronger and more durable. 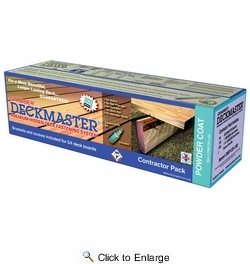 With Deckmaster there are no exposed screws a primary entry point for moisture and deck board damage. 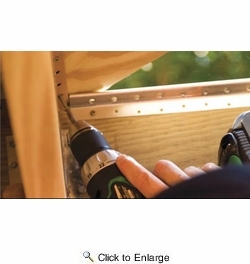 Stains and splinters around fastener holes are eliminated because there are no exposed screws or nails. Use this kit for 5/4" Deck Boards. Composites measuring 1-1/8" or more. Includes (100) Brackets (1200) 10 x 1-1/4" deck board screws, (1100) 8 x 1" joist screws and (1) Pro Bit Tip LOX 2 Drive.